Babbling Brooke: Present the Best You! 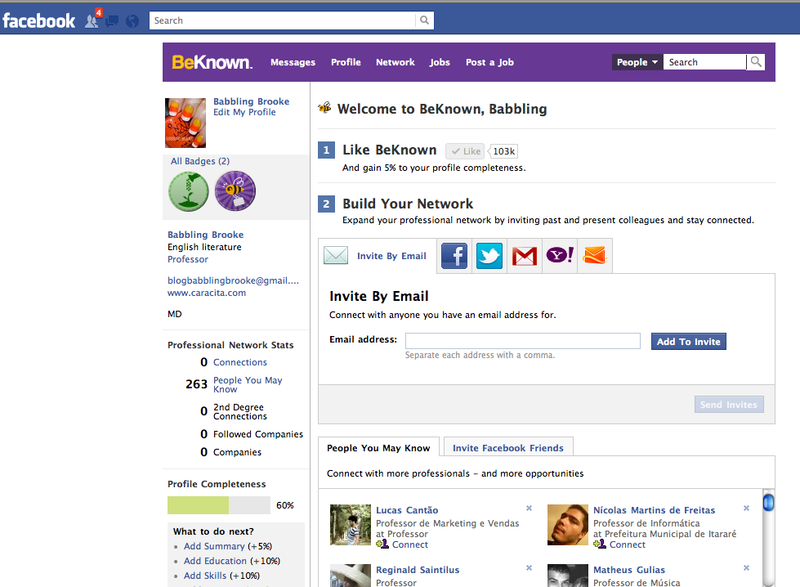 Monster just released a brand new Facebook and iPhone app called BeKnown. BeKnown is an awesome networking app for professionals. 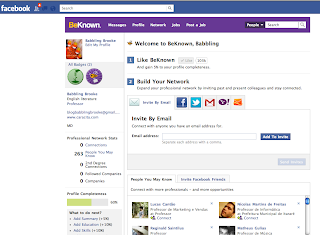 With BeKnown, you can set up a professional Facebook page completely separate from your personal Facebook page. This can be a great way to display your resume to potential employers, plus it can help you connect to a huge network of professionals in your field. College Pages, part of BeKnown, even connects you to fellow alumni and recent graduates. With BeKnown, you can discover new job opportunities and network with local employers. In this current job market, it is increasingly important to promote and control your professional online presence. Employers are drawn to potential employees that are engaging with new forms of technology and social media. BeKnown is an excellent way to expand your job search and professional online presence. The absolute most important tip during an interview is to demonstrate your enthusiasm about the job. This can be tough if you're nervous, but keep in mind that employers want an employee that really wants to work there. You can show your enthusiasm by learning more about the company and visualizing how you will help them. A tip I wish I had realized sooner is to ask the interviewer what specifically they are looking for. When I went on my first teaching interview, I attempted to act scholarly and serious, but I came across as dull and boring. It wasn't until I starting talking to some of the full-time faculty that I discovered that they were actually looking for someone with exciting, current ideas and creative ways to use technology. I was taking the wrong approach to these interviews and hiding my best attributes. By asking the interviewer, or other people who work at the office or have jobs similar to what you are interviewing for, you can help prepare yourself to be as successful as possible. Keep in mind that it is important to look professional, but make sure that you are comfortable also. Wear lower heels so you can walk without worrying about a slip, trip, or wobble. Remember too that it is always better to be over-dressed for a position than too casual. I've discovered that I feel more professional when I wear my blazer and dress pants versus when I wear khakis or a flowing skirt. Don't forget that you are there to sell yourself. If they called you in for an interview, they already think you are great and they want to hire you. Keep reminding them of all the things they love about you. Don't think that just because you said something in your resume or cover letter that you shouldn't mention it again. You should! I tend to feel uncomfortable about my accomplishments, so I try to cover them with jokes. But an interview is the last place where you want to put yourself down or downplay your accomplishments. Emphasize your best attributes, and explain how they will benefit the company you are interviewing for. This sounds obvious, but it amazes me how often people don't do this. Learn as much as you can about the company you are applying for. Find out who will be interviewing you, if you can, and what exactly they are looking for. Trust me - there is nothing worse than sitting through an interview wondering what the interviewer is talking about. It is unbelievably awkward! The only way you will get this interview for your dream job is to network, apply, and have a strong resume and cover letter. BeKnown is an excellent tool to help you find local professionals. Spend time now writing a strong cover letter that you can easily tweak for various jobs. It will take time (and it should), but having a well-written cover letter will set you apart tremendously. On that same note, writing thank you notes after the interview is just as important. For most companies, email is just as appropriate as snail mail these days. Speak specifically to your qualifications and skills, and address areas you talked about during your interview. Doing this sets you apart and reminds the interviewer(s) of your enthusiasm and skills. Self-talk is so important before an interview. Visualize the interview going well, and remind yourself of how fortunate the company will be to have you. Even if you worry that you may be under-qualified, think about what you have accomplished and how you are qualified in so many ways. Listen to upbeat music, and give yourself enough time to get to the interview so you are not stressed out. Think positive and walk into the interview full of confidence. Remember, if they want to interview you, they already want to hire you. Good luck! As a recent graduate, it can be overwhelming trying to find your place in the competive job market. Joining BeKnown is a great way to get started. You can easily sign up on Facebook and download an iPhone app to keep you connected no matter where you are. Good luck with the job hunt, and be ready to ace those soon-to-come interviews! Discloser: I am a blogger participant in Monster's "Present the Best You" online contest. All opinions (and tips!) expressed in this post are mine. As a participant, I was provided a makeup kit and a business card holder.